Today we stopped by Ray’s Bitchen Kitchen. It’s a little portable “kitchen” along the side of the road. We have passed it several times, but we’ve never taken the time to check it out. Well, today we stopped and am I ever glad we did. I was fortunate enough to have a chance to talk to the owner and get some information from him. 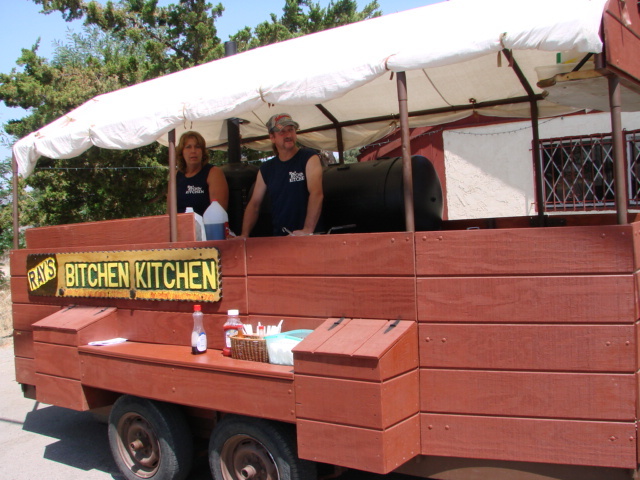 Ray built this portable kitchen himself on an old boat trailer. He has over 200 hours into it. It has steam tables a grill and a smoker. He made the smoker himself and is in the process of making another one. I know it has at least one burner because when I stopped back later to pick up a chicken, he had some of the smoked pork simmering away in a pot with some of his special BBQ sauce. He was nice enough to let me sample a piece of chicken this morning. He knew once I had a taste I’d be hooked. While I was there talking to him someone walked up and ordered 3 breakfast burritos. First thing Ray did was start grating fresh potato onto the grill, not frozen, pre-packaged hash browns, fresh real potato. The breakfast burrito consists of fresh grated hash brown potatoes, eggs, cheese and sausage gravy, the kind of gravy you usually get on an order of biscuits and gravy. They sell for $4.00 ea. 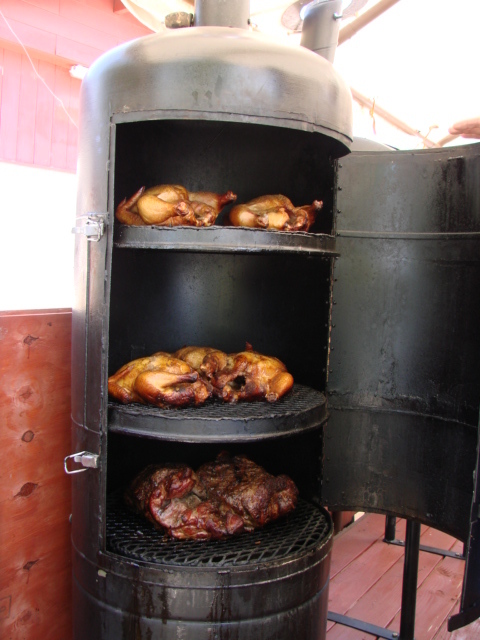 He smokes the meat with a moist heat using high desert apricot wood from 60 yr old apricot trees. The wood has been drying for 15 years. This wood is from the trees he picked apricots from for 10 cents a box when he was a kid. 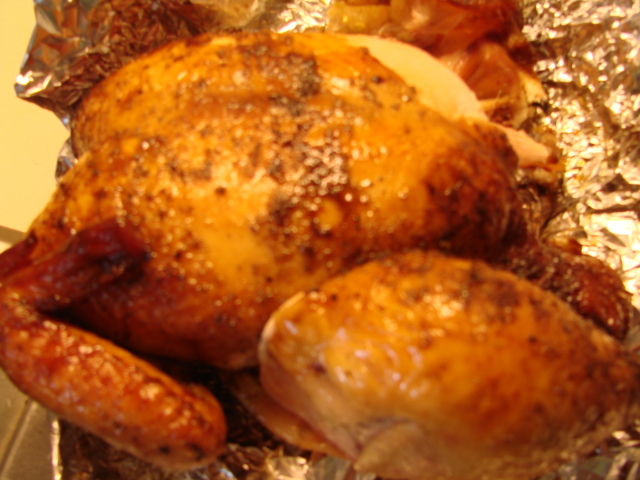 The chicken is nicely smoked, tender and juicy, not in the least bit dry. I did get a taste of the pork while I was visiting with them this morning and it is delicious. The photos didn't do it justice. 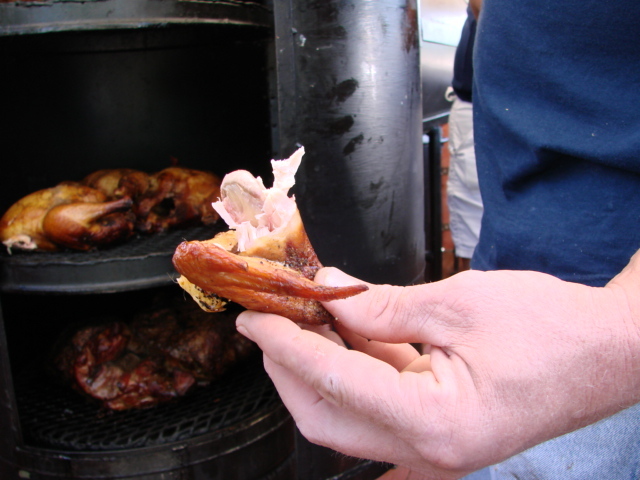 It had a nice smoke ring and tender, juicy, tender. I love it when the smokiness lingers after you are finished eating a smoked meat, this does that. I tried to get a nice picture before Stan tore into it. I almost succeeded. His main business is catering so catching him on the roadside isn’t a guarantee. If you want to try it out give him a call before you take the drive. While you’re at it, be sure and order a chicken to make sure you’ll get one. 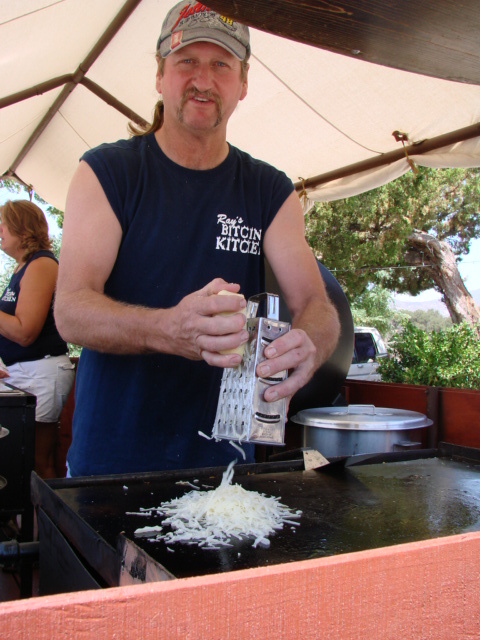 He usually sets up his Bitchen Kitchen in front of the old, now defunct, Village Inn Restaurant in Lake Morena Village on the weekends, if he doesn’t have a “gig” that day. His lunch plate is made up of your choice of smoked chicken, beef or pork with his wife’s homemade from scratch, Boston style baked beans and rice for $6.50. He does have a cole slaw that he makes but it’s not always available. He tries to switch up the menu and keep it varied.